A map of the site from the original RFP’s fact sheet. Courtesy Metro. In a surprise move earlier this month, King County officials decided to restart the process that could eventually construct hundreds of affordable housing units within walking distance of the Northgate Station. The decision will likely delay construction of an eventual dense, mixed-use transit oriented development project. The revamped process could yield hundreds more units of housing, including additional affordable housing. Metro, which owns the parcel that will eventually become the site of the TOD project, cancelled a request for proposals on June 5. Two companies, Lake Union Partners and Stellar Holdings, answered the original RFP. The developers did not respond to requests for comment. In a notice sent to the bidders, and in subsequent public comments, county officials explained that they cancelled the RFP to incorporate new and anticipated changes to laws governing the RFP process. A new state law, which came into effect June 7, allows local governments to give surplus property to developers for free, as long as the property will be used to house families who earn 80 percent or less of the locally adjusted area median income. 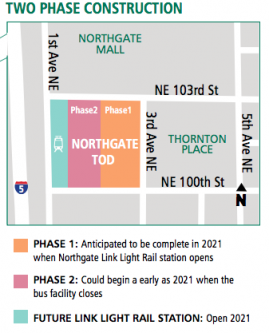 Meanwhile, the Seattle City Council is considering whether to upzone the Northgate TOD plot. As Bruce pointed out, an upzone could make Northgate a major urban center. 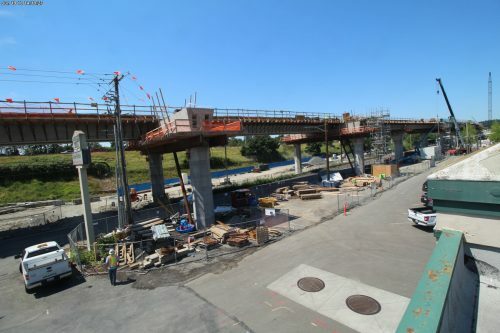 Northgate Station under construction from the TOD site. Courtesy Sound Transit. Diane Carlson, Metro’s Director of Capital Projects, was involved in the decision to cancel the initial RFP. Carlson says that the county wants to take advantage of the statutory changes because of the site’s potential. “We’ve given [ourselves] an opportunity to potentially create more housing on that site, and we want to take advantage of that,” Carlson says. According to a 2017 Metro document, the original RFP requested “up to 200 affordable units in Phase 1, as a part of 500-600 units.” According to Carlson, Metro wants the new RFP to include additional affordable housing units. Carlson did not specify what the final number of units might be. “We will certainly seek to incentivize those proposers in the new RFP process to provide as much affordable housing as possible, so I do think we will be looking for more,” says Carlson. Carlson said that the ultimate number will be determined, in part, by economics. Carlson said that Metro is hoping to work with a joint team of market-rate and affordable housing developers, and she’s optimistic that the lower cost of the land transfer will draw more affordable housing bidders. The potential upzone could also make the parcel more appealing to developers, since it would increase cost efficiency in construction, and potentially yield more commercial units. The cancellation was not received well by Seattle Councilmember Debora Juarez. In a June 8 email that Juarez sent to her council colleagues, Mayor Jenny Durkan, and city and council staff including Carlson, Juarez criticized the county’s decision. Juarez objected to the cancellation mainly on the grounds that delay would exacerbate Seattle’s housing crisis, and says that the county should have anticipated the new state law. “Losing this project or having it severely delayed has significant ramifications for the area, the city as a whole and our region,” Juarez wrote. Mercedes Elizalde, one of Juarez’s staffers, said that Juarez was told that the original RFP had a projected 2019 construction start date. Elizalde also said that the councilmember was frustrated that Metro had not promised, in writing, that the new RFP would include more affordable housing units. Carlson isn’t sure when the new project will get under way. Carlson also cited the need for a code change by the King County Council and the winning developer’s timeline as hurdles to meet the original construction schedule. But she was confident that the county made the right decision. This parcel should not be developed until the Northgate rezone is approved. If Northgate gets approved for taller buildings, that parcel could be built out to provide a higher capacity. If it gets built out before the rezone approval, we’ve just wasted potential living space next to the light rail station. The city is hindering itself by not having these rezones done already. The most obvious example I’ve seen is Broadway. In the early 2000s it was limited to four stories and there was the usual opposition to upzoning. Never mind that nearby Bellevue Avenue had several six-story buildings and they weren’t hurting anybody. QFC moved across the street into the Broadway Market to replace a small Fred Meyer, and left its old one-story building empty. A block away, Safeway’s one-story building was still open. The owners of the two supermarket lots said they wouldn’t redevelop until it was upzoned to six stories, because four stories wasn’t enough to make it worth it. Then the lot at the top of the Broadway-10th-Roy Y redeveloped and a four-story apartment building went in. A couple years later the city upzoned Broadway to six stories. Immediately the QFC and Safeway lots were redeveloped with six-story buildings. But we’re stuck for decades with the new four-story building and every time I look at it I think of the 20% more units we’re missing out on. So if there’s an upzone pending in Northgate, by all means get it through immediately so that landowners don’t have the dilemma of whether to wait or not. Couldn’t agree more, Mike. The 7 story TOD going on top of Cap Hill station is such a missed opportunity. Cap Hill zoning ought to be revisited in its entirety in fact, yet I doubt this council will be able to accomplish anything meaningful. If Juarez is so concerned about the Northgate TOD, she should fast track the upzone, and then upzone the upzone during the upzone deliberations. They did accomplish something for the station area, and it wasn’t that meaningful. The college land is zoned for something like 13-story buildings, if the college ever expands that much. Right. I understand and sympathize with Juarez’ frustration, but her energy would be better spent imploring her colleagues to discover some urgency about the Northgate upzone. Seattle’s delay makes no sense. City Council argues there is not enough affordable housing and they cancel an RFP to develop housing? All talk no action. Get to building units, stop delaying. Their own inability to rezone Northgate is their reason to not redevelop. They are blaming themselves for the this. Seattle didn’t stop this project – King County did. Just like King County is continuing to delay and just do nothing on affordable housing, homelessness response, and transit capacity preparedness. Correct me if I’m wrong, but are we not looking at LINK’s inauguration of Seattle’s time honored tradition of two liberal government agencies commencing twenty years of hostilities over a goal they both ardently believe in? And then first build the 200 units, and add the rest of them later. Would some architect please weigh in and tell us how many seconds it takes to make an OOU (Obscenely Overpriced Unit) Affordable? Better pray that James R. Ellis is permanently retired. Sparing City and County the conversion of the King County Administration building, the Court-house, Second and Jackson, and Union Station into a giant underground hub for transfers between the Siberian Express and the Tierra del Fuego Flash. Also including twenty thousand Transit Oriented affordable units financed with a Modest Property Tax on Speculative Evictions. (MPTSE). As the McClearified State Legislature welcomes an oncoming wave of newly-elected lady valedictorians I just now Tweeted that age of office is 18. Who’ll legislate total affordability with one gavel-whack. By passing the IWW (I Wouldn’t Worryaboutit) Act raising all wages to afford every single residential property at market prices starting (Where’s STOPWATCH on my iPhone). Meaning it’s yours ’till the sun blows up. Next click you hear goes Viral! This appears to be a question about density and timing. It appears to me that the best way to approach the process this summer is to have the RFP list allow submissions to include both the zoning capacity today, and a future zoning capacity that may occur following an anticipated upzone (if one can be determined or decided in a short period of time). I’m not sure if that’s possible or how much making it possible would delay the RFP, so the best course of action does appear to be a schedule issue. I raise an eyebrow at the term “affordable housing” because that means so many different things. Is the goal to house the homeless, seniors in independent or assisted facilities, families in the short term, condo buyers in the long term, college student apartments, or what? Frankly, if the density question was resolved today, the building would still not open until 2021 at the earliest. The housing affordability problem is more acute than that. A delay of a few months or even a year wouldn’t be bad in this context. It would be better to have twice the number of permanent units a year later than rush to a project to get the opened by 2021. The city certainly knows what zoning it wants to propose, and the RFP could solicit plans based on that. The developers can also make plans that are flexible enough to add or delete a few stories if the final zoning ends up different than the preliminary expectations. Easily comprehensible description of “Affordable Housing”: Unionized public works jobs undeferring enough maintenance to save an earthquake the trouble of destroying city, county, state, and wait’ll 2020. Backed by a union contract that makes 15% a tip at a diner. Has worked before. Don’t want to say we need another war too, because threat of one is already excuse to nauseating praise for a dictator we could buy off with a junior ORCA card. So isn’t “Pay People Enough Money They Can Quit Jobs They Don’t Like and Find Use for Credit Card Shreds. PPEMTCQJTDLaFUfCCS a good definition? Announcer for that one gets a union-protected penthouse for life.